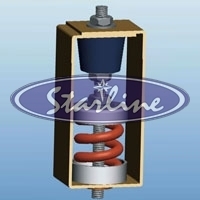 Starline Enterprises is one of the renowned Manufacturers, Exporters and Suppliers offering a wide range of Split Clamps and Vibration Control Products. The impeccable range of Split Clamps and Vibration Control Products that we bring forth includes Mild Steel U Bolt, Riser Clamp, Sprinkler Clamp, U Strap Clamp, Adjustable Clevis Hanger, Rubber Support Insert , Anti Vibration Spring Hangers, Anti Vibration Spring Mounts, Anti Vibration Rubber Pads and Anti Vibration Cylindrical Mount. Besides, we also supply Flexi Glass machine window to the customers as per their specifications. The raw material used in manufacturing of Split Clamps and Vibration Control Products comprises Sheet Metal (CR / GI), Engineering Plastics as well as Natural and Synthetic rubbers. Al the products are fabricated under the supervision of the quality controllers to ensure a flawless range. Besides, testing the products are also checked for their proper packaging in Shrink wrapping tunnel in order to safely deliver them to different destinations. Along with the CAD and CAM facility, customized packaging facility is also available. Also, the clients are eased with the availability of Split Clamps and Vibration Control Products at competitive prices.